The only BYO Party Bus in our fleet is our Premium Party Bus. This fully licensed Party Bus gives you the ability to BYO wine, beer, RTD’s and soft drinks! The Premium BYO Party Bus has been designed to have social sideways seating through the center of the bus to ensure that you and guests can have a great time and enjoy the experience. Plus because you have the option to BYO you can make sure that it is an inexpensive night for your friends. Our Premium Party Bus is fully licensed. A great way to enjoy the party from the very first pickup. This is the only bus in the Party Bus fleet that you can BYO! We offer a BYO option for wine, beer and RTD’s. 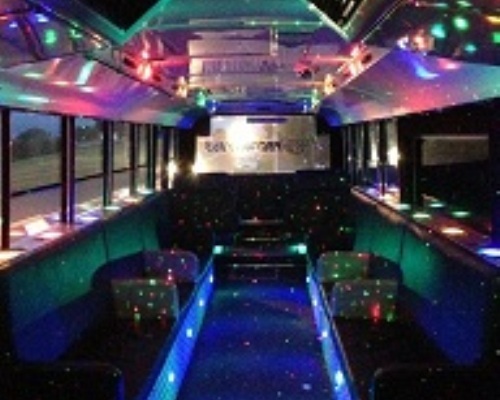 Our premium Party Bus has LED lighting and a great sound system that you can plug into with your phone. The layout of this bus is awesome, with the majority of the seating sideways or facing the center. * Pricing is valid for pickups & drop offs within 20kms from Auckland CBD, a final drop off before 12am & subject to availability at the time of confirmation. Please note that if you are making a booking on a peak date including the weekends leading up to Christmas or dates that major events are on in Auckland our pricing above will exclude GST. Your price will be confirmed in writing at time of enquiry. We can easily help you with a hire outside these times and areas, however we will need to quote pricing prior to confirming your booking.